Are you sitting on the fence about getting or not getting a gun belt? 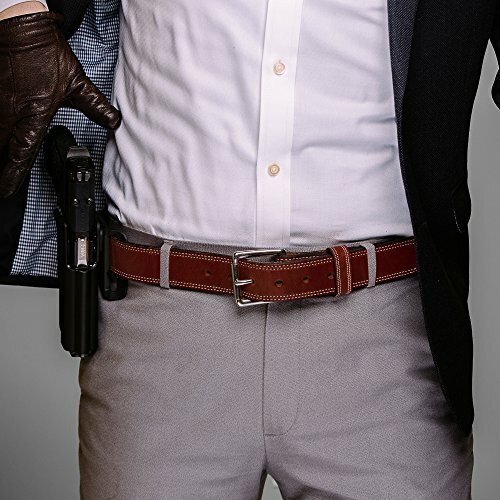 Well, what’s to consider since this type of belt is made to better hold your gun, in a comfortable way? Oh, and there is also the part about how it looks better than a regular belt! Leaving the joke aside, don’t forget that a gun belt is also made to outlast you (we don’t live in the Wild West anymore, so you should live longer than back then), no matter how often you use it, which speaks of their durability and how well they’re made. You can select your gun belt to your taste, of course, and put comfort or life span second, and only care for the looks. However, if you own a gun, chances are that looks shouldn’t be ever on the first place. When we take a closer look through most reviews out there, we see two big sides about which is better: the leather or the nylon gun belt? We sit in the middle this time and nicely only give you some hints. 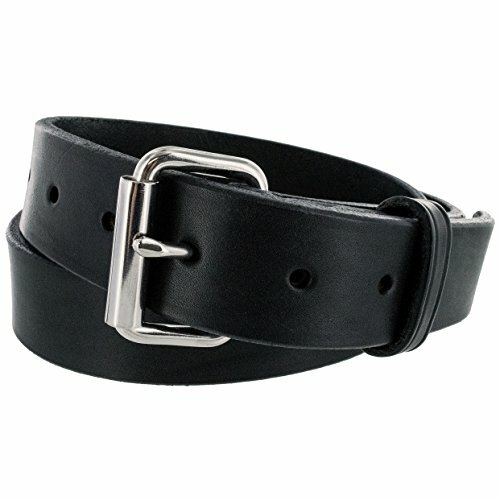 Some think any leather gun belt looks better than any nylon model, whereas new generation say we should put leather back in the closet where it belongs. Leather softens in times and gives you the best comfort after a while and a nylon belt can’t do that, but it may give the perfect fit right from the beginning. Best gun belt to hold isn’t always the most durable out there, but it gives the best hold for your gun and holster for some time. A thicker leather gun belt does offer more holding ability than a thinner one and this relates to the strength of the belt. A reinforce dual-layer belt presents more structural rigidity so holds better than two pieces of good leather. If your mind is on a nylon gun belt, take a look if it’s rated for heavy use as a tow strap is. 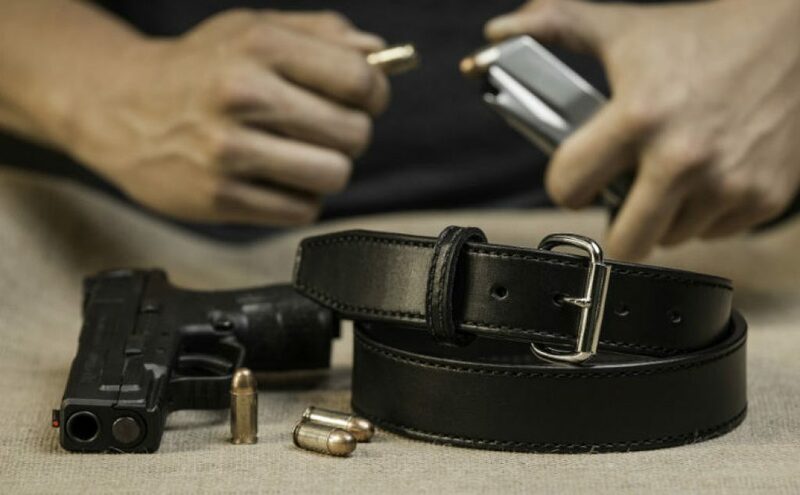 No matter what you choose in the end, keep in mind that your gun belt should give you the best comfort, hold and fit, which makes it the best choice for you. The only bad thing about a leather gun belt, such as the Hanks Belt Concealed Carry CCW Full Grain Leather Gun Belt, is that it may last longer than you, since it comes with a 100-year warranty. The Hanks belt is made in our USA from USA-grown leather so this is a good hint on the quality of the belt. 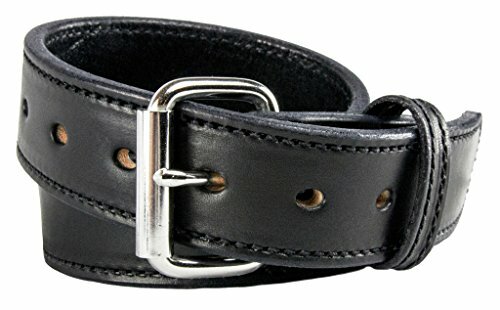 The belt is very well made and the leather is thick, yet flexible. It’s especially designed for concealed carry. The gun belt has a solid build so it anchors your holster and gives you easy access to your firearm. The gun belt is actually made of 100% full grain leather and it’s one piece, with no fillers whatsoever. The belt is long lasting, tough and takes the intense use and the weight of your gun. The buckle is removable and fastened with Chicago Screws, also removable. This also increases the durability of the belt. The belt is finely crafted and has a sturdy build. It looks good and is a heavy-duty option to carry your gun. It gives great support and is reliable for a long time. 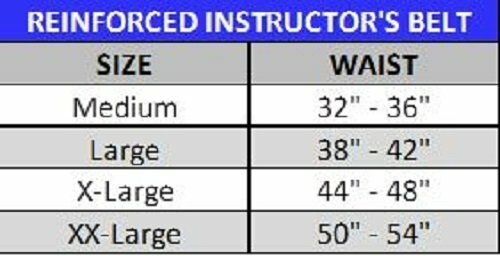 The sizing has a wide range, so you can easily find the perfect size for you. As it looks good, it’s thick, strong and reliable, this Hanks gun belt is a great USA-made option any day. Going shopping with a fixed budget isn’t a joy, especially when you go with an image in your mind, but it’s not impossible to get a good leather gun belt for a fair price. 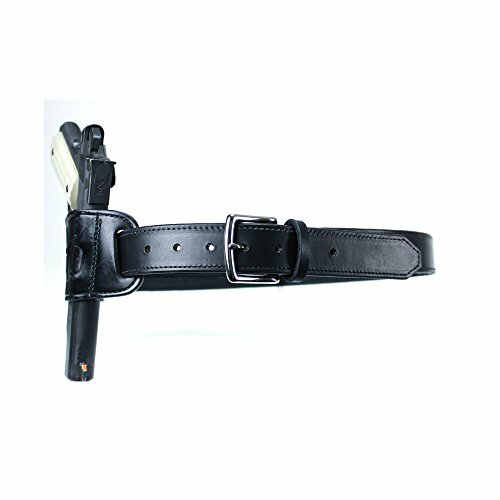 This Genuine Leather Gun Belt sure fits the category of fair priced leather gun belts that are good quality and reliable at the same time. The gun belt is made with a nice, genuine leather, which explains the leather smell that doesn’t wear out from the first day. Along with the natural leather fragrance, comes the natural color of the gun belt, which gives it a simple, yet elegant appearance. As it’s made with natural leather, keep in mind that natural isn’t perfect, but all small imperfections fit naturally in the look of the belt. The gun belt is 2.5 inches wide and it’s better to add 4-6 inches more than your pants size. Keep in mind when sizing the way you’re going to wear the belt; straight or at a slant style may bring differences in sizing. It’s very important that measure below the waist, above your hips, just where you plan to rest the holster. The gun belt is well made and looks nice. It goes great with your holster, and takes even two of them. Despite the minimal issues, the gun belt is a good, fair-priced option when in need. 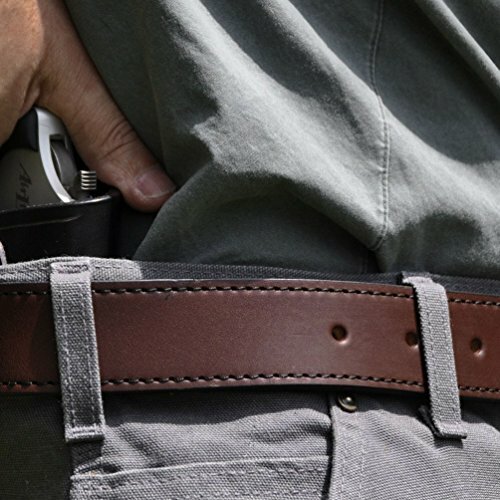 When you are determined to get a gun belt that is made to last forever, give it a go with the Ultimate Concealed Carry CCW Leather Gun Belt – Lifetime Warranty. The gun belt is made in the USA and comes with a lifetime warranty- that’s how much the manufacturer believes in it! The belt is made of high quality leather that doesn’t sag, bend nor stretch and gives a rigid hold for your IWB, OWB holster, mag pouches or any other gear you wear. The Premium full grain US leather used on the belt is strong and carries your gear in a stylish way. It’s handmade of one piece of Full Grain leather, which makes it both thick, rugged and long lasting. it contains no multiple piece laminations, nor plastic inserts. The gun belt comes with a removable buckle and wears a nice leather smell that goes away after a while. The color and stitching are great and the belt has nice finish. The belt is a heavy-duty option that looks like a regular belt, but it’s rigid enough to carry your gun. 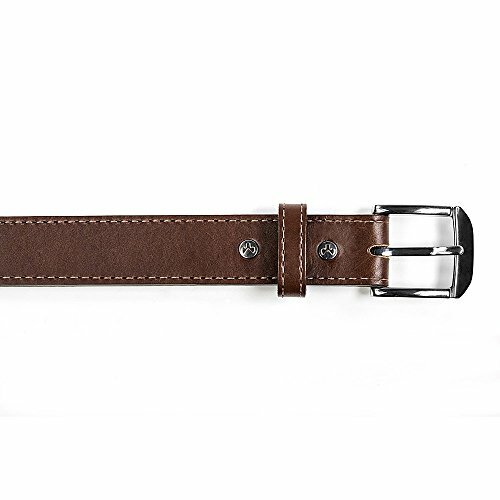 As it’s made with high quality leather and is rugged, comfortable and long lasting, the gun belt is a subtle, regular looking belt to have for you gear. Let yourself be surprised with the multiple and functional features of the Spy, Escape & Evasion Premium English Harness Leather. 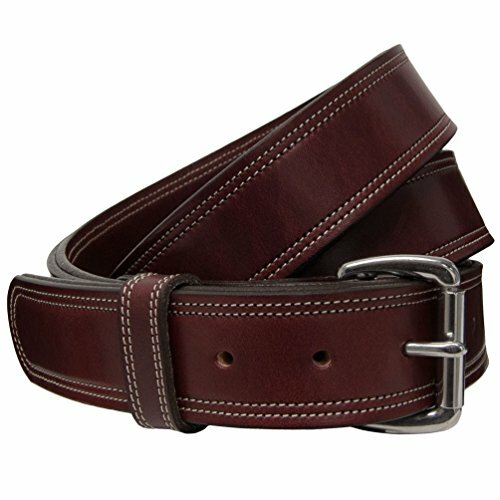 This belt is made with English harness leather, typically used in horse saddles. The belt features a nickel-plated solid brass buckle that is very strong and durable. When it comes to the functional features, we notice three hidden storage areas. There are in fact three hidden zippered-closed storage compartments so that you may keep survival gear hat reach and protected the whole time. The gun belt is very well made and the finish is impressive. The stitches hold together with polyester thread, the thread used in sails of yachts quality. The belt has a solid build and manages to be thick and pretty comfortable altogether. 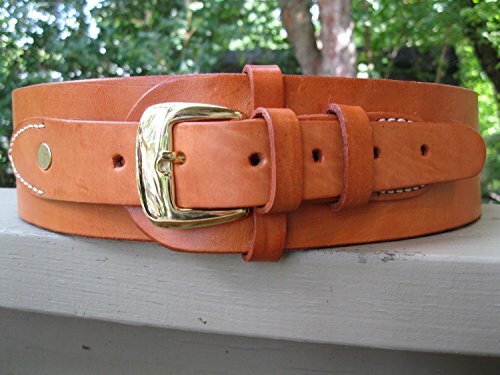 The craftsmanship is amazing and the belt has great quality. It’s a rugged option, without being bulky. 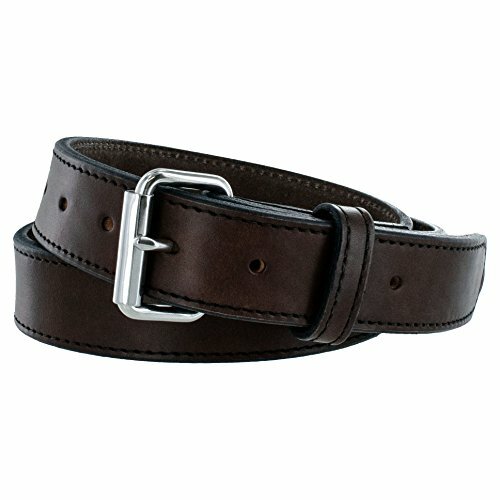 The gun belt comes in brown or black and you should double-check the width before placing the order. The cons aren’t deal breakers for us and the gun belt is a solid, tough and long lasting option anytime. Paying the extra buck for a gun belt doesn’t just mean you get a better quality belt, but also a longer life span and durability for the intense job. It’s the case of the Hanks Premier CCW Belt – 17 Ounce DOUBLE THICK LEATHER Concealed Carry Gun Belt that comes with a 100 year warranty, which says much about its endurance and build. The gun belt is made in our USA of USA vegetable tanned leather so it’s 100% American. It’s made of Double English Bridle Leather and manages to bring a sophisticated note to your appearance. It’s able to anchor your holster for easier access to your firearm. As the gun belt is made of 100% full grain leather, the belt has a nice patina that age beautifully. The more you wear it, the better it looks. The belt is soft and long lasting. The gun belt is thick and doesn’t stretch rollover or sag. The buckle looks nice and is removable. It’s fastened with Chicago Screws (also removable) so it’s not difficult for you to remove the buckle. The belt runs true to size and manages to be thick without being bulky. You may use it for concealed carry. The belt has a great construction, with nice finishes and fit. The double stitching is long lasting and everything about the belt says durability. The attention to details on the belt is amazing which explains the nice look on the back of the belt. In addition, for the final touch, the hand staining of the edges completes the looks on the belt. Despite the minimal cons, for the durability, nice look and build, the gun belt sure makes a great buy. It’s not that we’re shallow, but sometimes you know by the label of your product (no matter which kind) that is going to be a great product. This sure explains why the Hanks Kydex Belt – Kydex Reinforced Gun Belt doesn’t disappoint us and doesn’t surprises us with its quality either. The gun belt is made in our USA with USA leather, so it’s 100% American and you can be 100% sure of its quality. The design of the belt is well thought out and you get a belt that has a slimmer profile, but it’s able to carry anything. As if the 100% full grain leather used wouldn’t be enough, the belt features Kydex stiffener and rugged high tensile strength nylon. The kydex improves the strength of the belt and doesn’t wear nor tear, ageing so nicely. The gun belt becomes strong, not too thick and with good flexibility. As for the nylon backing, it’s important as it makes it easier for you to put on/take off the belt. If we take a closer look, we see the belt is made of vegetable tanned leather and is .22-.23 thick. It doesn’t stretch, rollover nor sag. The gun belt is able to support any firearm and gives good rigidity. 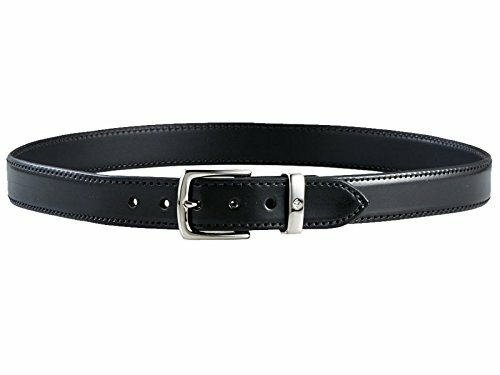 The stitching on the belt is very well made and the overall craftsmanship on the belt gives a long lasting, tough belt. Let’s not forget to mention the roller buckle that fits the belt as it’s a heavy-duty one. The roller sure makes it easy for you to snug or cinch down, as you like. Good quality Chicago screws screw together the belt so you may swap buckles, when in need. The screws don’t loosen like snaps and really stay put. The minimal flaws aren’t major at all and we still consider the belt to be a great option as a leather gun belt. Don’t be surprised if for a very good price you can get a very good quality gun belt that looks nice and is rugged altogether. The Aker Leather B21 Concealed Carry Gun Belt is made in our USA and uses fine vegetable-tanned cowhide and raw materials. It’s tested by law enforcement all over the world. The gun belt comes with a polymer insert, which increases the stability and flexibility for concealed carry. The risk for weapon sagging or rollover is minimal just as well. The belt is functional but it has the looks of a dress belt due to its full leather lining, custom metal buckle, feathered edges and keeper. The belt is thick and stiff, but manages to remain comfortable after in case of long time wear. It fits well and has a sturdy build. The gun belt looks good and is good quality, especially considering its price. The stitching is very well made and the gun belt leaves a durability feel. For better fit, you should get a belt 2-4 inches above your waist size as the belt is measured by inches. It’s a belt designed for concealed carry, which explains the sizing. All in all, for the money you pay, you get a good quality, comfortable and sturdy gun belt hand crafted in our USA. If you are in need for a gun belt for concealed carry, there are so many options out there to choose from. We decided this time to give you a closer look to the Hanks Extreme Gun Belt for CCW as it brings great quality for quite a good price. The gun belt is very thick, but this doesn’t make it any less flexible. You may even bend it, without damaging its shape, as a matter of fact. The gun belt is rugged and can handle so many of you gun accessories: taser, holster, flashlight, mag pouches or radio pouch. 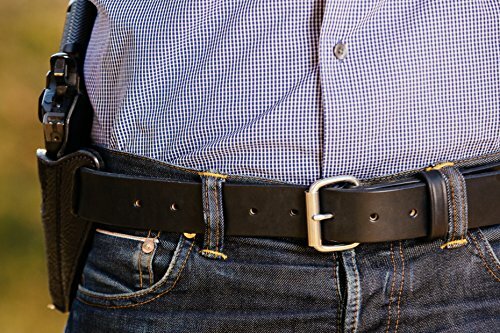 Another great thing that catches your eye is the versatility of the belt that easily goes from concealed to open carry, or from on-duty to off-duty. You may also wear the gun belt with the holster you like most: IWB, OWB or SOB. In addition, if this wasn’t enough already, it’s also good to know the belt works with snaps, loops, paddle or belt clip. The belt is made with fine 100% American bulls and each belt contains a strip of full grain bull hide leather. This means the belt is long lasting and tough. The buckle comes with Chicago crews which you may easily remove. The buckle looks nice and doesn’t lose shine not even some time. The strong hardware on the belt fits the overall strong build. The gun belt is attractive and combines strength and stylish look very well. The gun belt is very well made and the craftsmanship is impressive. Nevertheless, the cons are minimal and the gun belt is thick, strong and nice looking for concealed carry or open carry just as well. From all the gun belts for IWB out there, this time we decided to give a closer look to the Magpul Industries Tejas Gun Belt as it can surprise anyone with its quality and strength. 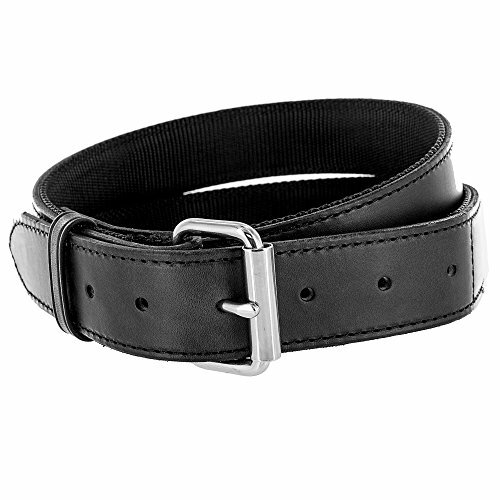 The gun belt has an outer surface made of nice, long lasting leather and an inner polymer. Both materials are thick and give a sturdy, rigid in a good way belt that doesn’t lose its shape. The belt manages to allow comfortable fit and is flexible just enough for a nice movement. The double layer design creates a sturdy, durable and thick gun belt that is very reliable. The stitching is very well made and the belt takes the intense use. The silver hardware and the heavy-duty buckle complete the image of the belt. The buckle comes with tool-less screws so it’s easy to remove, if that’s what you want. The gun belt comes with a rather regular look, but its build is far from regular. The belt doesn’t stretch thanks to the reinforced polymer inner layer. In order to preserve the belt, it’s better not to use leather softener. Keep also in mind not to bend the belt back over the buckle more than 90 degrees while tightening. You may weaken the stitching or strain the leather like that. The minimal flaws aren’t deal breakers for us and we think the gun belt is a great choice for IWB. 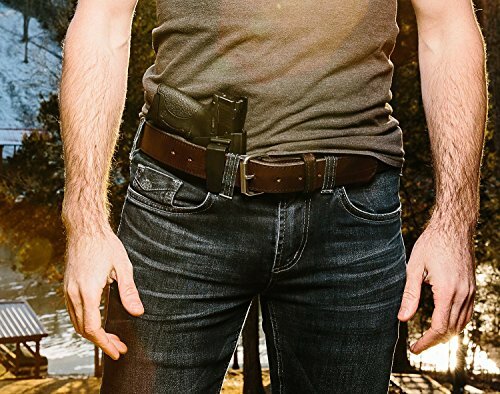 Getting an EDC gun belt means you need to look for a gun belt that is sturdy enough to hold your gear, but comfortable enough for long time wear during the day. 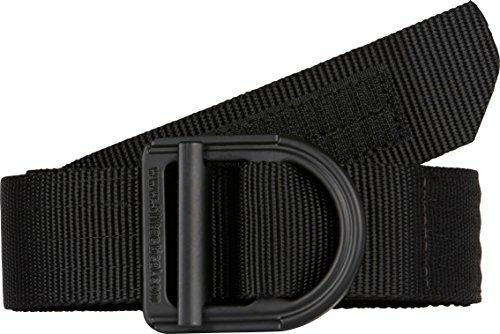 The 5.11 Tactical Trainer 1 1/2-Inch Belt fits the description and manages to be durable, comfortable and highly functional without adding the weight. The gun belt is made of nylon mesh, which means the gun belt is lightweight and comfortable to wear even for a long day. The 1.5-inch nylon material used on the belt gives its strength and durability though, creating a nice balance for EDC jobs. The gun belt comes with a durable stainless steel buckle that looks good and completes the EDC profile of the belt. The buckle is also strong and has a 6000lb rating. Its black matte finish is subtle and gives a nice tone of elegance, sort to speak. The reinforced stitching is very well made and ensures the belt the durability we mentioned in the beginning. The long lasting nylon webbing keeps safely in place the buckle and the Velcro locking system means safer locking also. The gun belt is able to take many of your duty holsters and keeps everything in place. The belt is easy to use, tough and doesn’t lose its shape even in case of intense use. Moreover, let’s not forget the attractive price that may seal the deal for many of you. Nevertheless, for the price you pay, you get a dependable, tough and versatile gun belt for your EDC jobs. Don’t fall into the trap of misconception that a nylon gun belt isn’t as good as a leather one. By all means, you can find great quality nylon gun belts that make some leather options a real joke. Additionally, they are typically cheaper than the so much praised leather gun belts. To make us more convincing, take a look at the Uncle Mike’s Tactical Two-Layer Nylon Reinforced Instructor’s Belt that brings durability and toughness, even though it’s made of nylon. 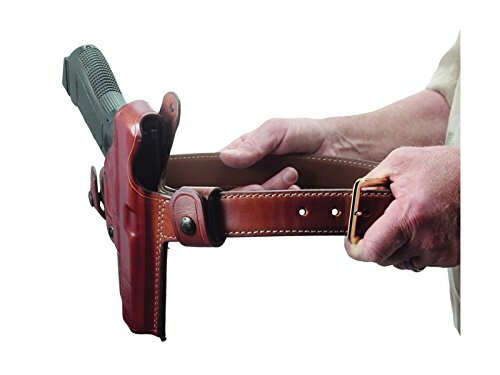 The gun belt presents an ideal width that makes it a great option for jeans, khakis and BDUs (1-1/2”) and is very well made. The double-layered design make the gun belt strong and durable. The stitching is very well made and the belt takes the intense use. The polymer reinforcement between the two layers of rigid nylon makes it able to take heavy pistol at ease. The belt presents a traditional rescue/rigger belts design, which makes it so good for gun carry. The metal buckle fits the picture as well. 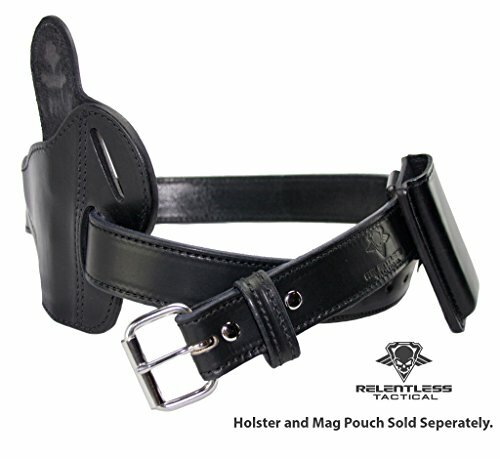 The belt is high quality and keeps holster in place. It remains comfortable, though it’s rather stiff. It’s easy to use, versatile and runs true to size. Let’s not forget the belt features also Velcro, for more versatility. The cons aren’t deal breakers for us and we think the gun belt is a choice to consider when specifically shopping for a nylon gun belt. Get a dependable tactical gun belt like the Elite Survival Systems Cobra Rigger’s Belt with D Ring Buckle for your challenging tactical jobs. The tactical gun belt is very strong and sturdy. It features a D-ring Cobra buckle and a safety hardware, which combines a rescue D-ring, and a Cobra quick release system. The buckle is rated at 4000lbs (straight pull), whereas the D-ring is rated at 5000lbs (straight pull). In case you missed the standards, just know that the belt exceeds the NFPA standards for fall protection. If we go through the specific numbers, we see the belt is made of 1.75” mil-spec type 13 webbing and presents a 7000lb tensile strength. The belt also features a full rigger’s stitch on the D-ring side. The good and useful rigidity of the belt comes from the internal stiffening layer, which also supports holsters and pouches. The belt is solid, stiff and holds everything in place. The buckle fits the picture as it’s also solid and the webbing is very well made. The belt is a heavy-duty option that is made in our USA. You can choose from the three-color options: coyote tan, olive drab or black. The minimal cons don’t undermine the overall quality of the belt that is a great option for any tactical purpose. There’s no doubt about it: when it comes to leather gun belts, nobody knows better their job than Hanks does. So it’s only natural that a good gun holster belt to talk about is one like the Hanks Stitched Gunner Belt. The gun belt is made with solid leather that is strong enough to carry your holster, giving you easier access to your firearm. The belt is actually made with one-piece 100% full grain leather and no fillers whatsoever. It looks better with age, without losing its strength. The vegetable tanned leather on the belt not only looks nice, but also combines great with the metal buckle. The belt is around .22-.23 thick and doesn’t sag, rollover nor stretch. This means you can abuse (in a good way) the belt and add extra ammo anytime. As for the metal buckle, we need to mention the removable part with Chicago screws and not snaps. The gun belt is versatile and presents high quality. The craftsmanship is impressive (those Amish craftsman really know their job!) and the fit and finish are almost flawless (there’s no such thing as perfect). Nevertheless, the gun belt is a great support for your holster and brings high quality and strength for 100 years. Literally. Going shopping with a fixed budget is no picnic, but it’s not mission impossible to find a good, reliable gun belt that comes cheap. The Blackhawk! CQB/Rigger’s Belt sure doesn’t scare you off with its price, but doesn’t make it as a no.1 gun belt either (but, not even a leather belt is able to do that…so there’s that). The gun belt may not come with a 100-year warranty, but it sure may put a stunt on you with its rather long life span. Let’s not forget we talk about a gun belt that it’s not made of leather, but of thick, durable material. The belt features parachute-grade buckle and adapters that meet PIA-7195 standards. In English? The gun belt sure holds up safe and secure your gun, gear or any holster you may need at reach. The gun belt is sure versatile and tough. The 1.75” webbing has a 7,000lbs tensile strength, which sure means some power. 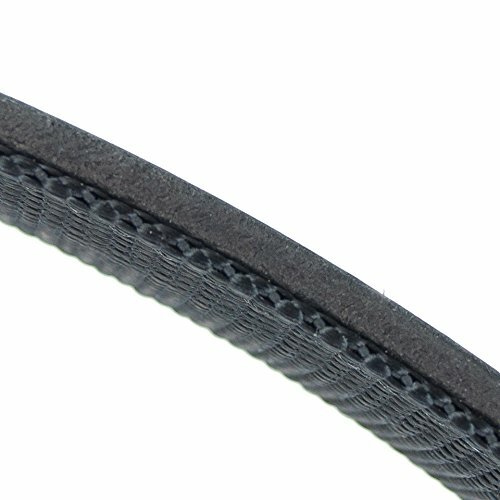 The belt also includes a hook and loop, ensuring more security for the running end. The gun belt is very well made and has no flimsy material in it. It’s flexible and only needs a couple of days to fully break in. it doesn’t sag and keeps your gear in place. If you find the belt too long for you, the Velcro holds the excessive belt strap so it doesn’t minimize comfortable wear. You get three sizes to choose from and four colors: black, olive drab, coyote tan, desert sand brown. Keep in mind you get a low priced gun belt, though, and for the money you pay you get a pretty durable, tough and dependable gun belt.